Fragrant, exotic, rich and delicious. When the weather turns cold it’s time to think of warm food. There’s two ways to accomplish that feat. The first is “spicy” food, the second is exotic. I trimmed. Note the size of the pieces relative to the knife. Often exotic foods can make us dream of faraway places where the weather is warm. One of my favourite cuisines that does so is Moroccan. Well spiced, but hardly – if ever – any searing heat. Fragrant and rich is a more apt description. 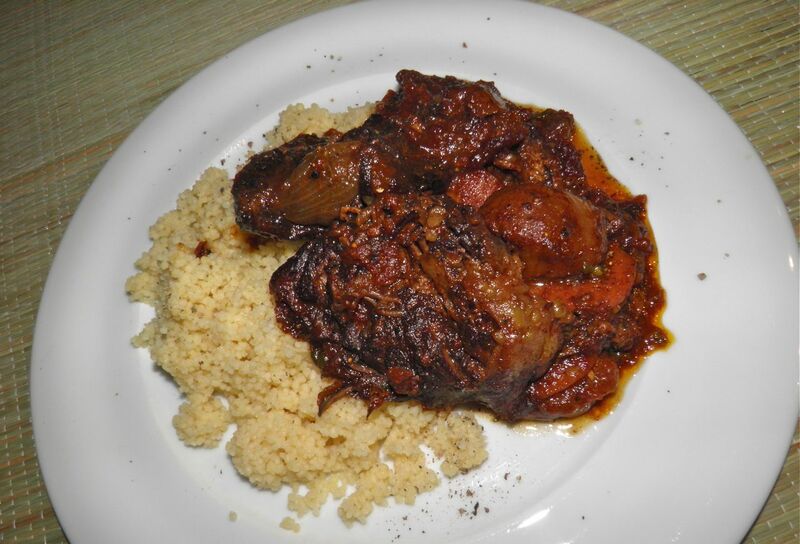 Moroccan cuisine is considered to be one of the most diverse cuisines in the world. Through their food one can plainly see influences left on the culture by trade, travellers and conquerers. The influence of the original inhabitants, the Berbers, can be found in dishes like tagine and couscous. The Arabs brought spices, nuts, dried fruits, and sweet and sour combinations. The Moors and Jewish populations brought olives, fresh citrus, preserved lemons and pickles. The Ottomans introduced barbecue techniques (like kebabs). Most recently, the French left behind a love of cafés, pastries and wine. Morocco, as a strategic gateway to the Mediterranean and Africa, truly became a melting pot of Empire influences. Set all to simmer for 3 to 4 hours, partially uncovered. It’s not that difficult to make food that hints at Moroccan influence. All you need to know is what makes things “Moroccan.” I’ve mentioned this before in other post when I said what makes things Greek, Italian, French, etc. Common spices in Moroccan cuisine include cinnamon, cumin, turmeric, ginger, pepper, paprika, anise, sesame seeds, coriander, mint and saffron. There are also dried and preserved fruits like dates, figs, lemons and limes. Pick a few and you have a start. I actually made this recipe up and then looked to see how far off I was from actual Moroccan recipes. Interestingly I discovered a recipe that was nearly bang on. Sadly my dried limes have been packed away or it would have been even closer. That was a let down. Everyone should have a bag of them in their pantry. 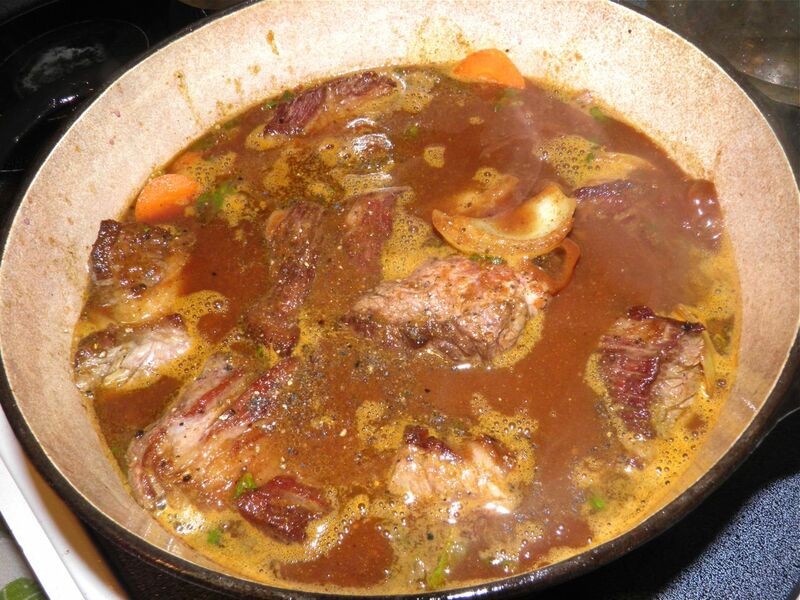 They're great in simmered dishes, like this, or even just added to the water when you boil rice. If you have the time (3-4 hours), or a crock pot, give this recipe a try. Despite all the spices it isn’t overly "spicy." They meld into something far different than the individual parts. The beef, cut in large pieces, falls apart as it cooks so cut it large. No need for a knife to eat this dish. The figs and carrots retain their form, as the mixture simmers. Heat the oil in a heavy bottomed pot with a lid or Dutch oven. 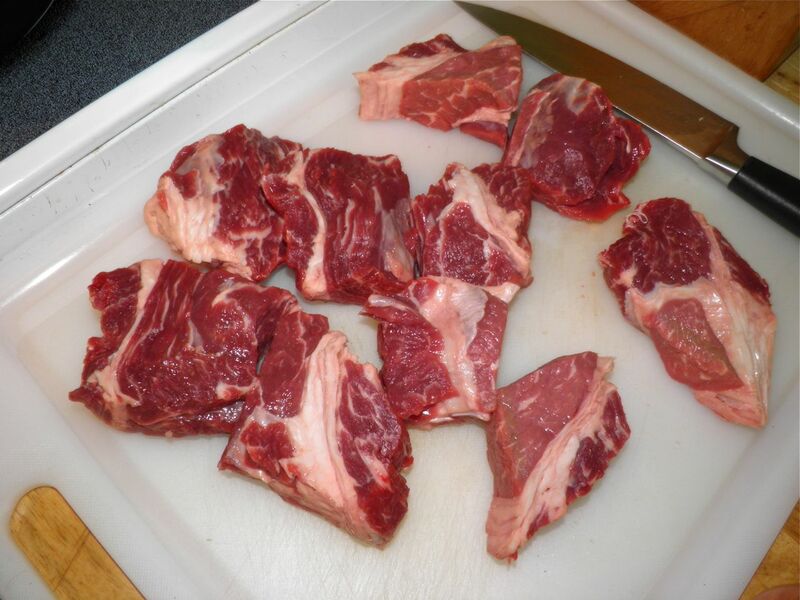 Cut the beef into very large pieces. Season with salt and pepper and sear until browned on both sides in the hot oil. 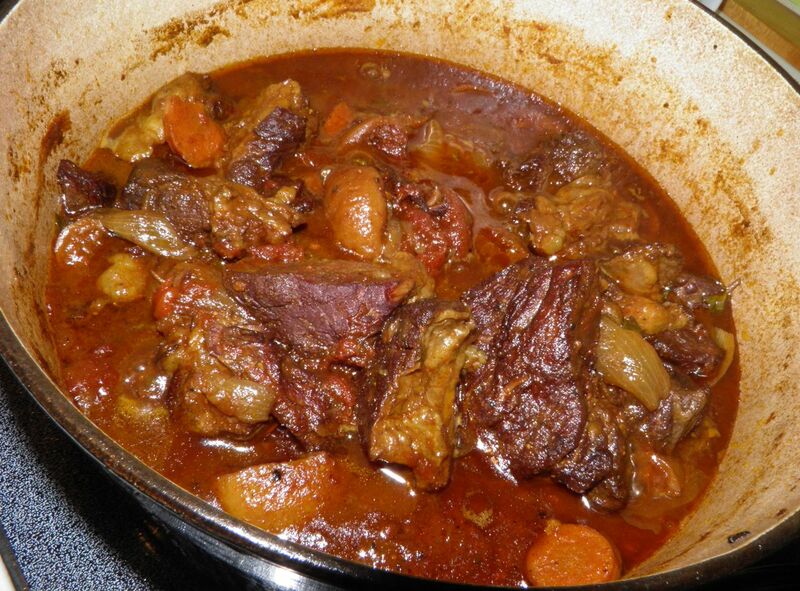 Do this in batches so the beef is not crowded. Remove to a plate. Add the onions to the pot and sauté for about 2 minutes. Then add the garlic and cook for a further minute. Then add the remaining ingredients and bring to a simmer. Nestle the browned beef into the liquid. Let the mixture simmer, slightly uncovered, for 3-4 hours. The sauce will thicken as the liquid evaporates. Skim off excess fat if you wish.